This article originally appeared in full in The Hill under the title, "Prepare for Battle: Israel, Hezbollah on the Path to War." Are Israel and Hezbollah headed for war? That's the question many analysts are grappling with in the wake of recent escalations involving an Israeli strike inside Syria that targeted a weapons shipment meant for Hezbollah. It prompted Bashar Assad's launch of three SA-5 surface-to-air missiles, triggering the first known use of Israel's Arrow-2 missile defense system. The conflagration was noteworthy enough for several Israeli newspapers to describe it as "the most serious incident" to occur between Israel and forces inside Syria in recent years. Since the end of their inconclusive 33-day conflict in 2006, conventional wisdom has always been that another war between Hezbollah and Israel was simply a matter of time, and when it happens, the extent of destruction in Israel and Lebanon will dwarf that of the previous war. Some have concluded that the promise of such devastation works as a measure of deterrence, at least for now. The questions then become, when will the war begin, and how will it be triggered? An Israeli airstrike in Syria targeting Hezbollah's military assets is nothing new. For the most part, Israel has kept out of the conflict, enforcing its long-held red line of preventing the transfer of advanced "game-changing" Iranian and Syrian weapons to the Lebanese proxy of the Islamic Republic of Iran. It's also responded to airspace violations and to intended or inadvertent artillery shelling that lands on the their side of the Golan Heights. Given official Israeli estimates, they have had only limited success, considering that the U.S.-designated terrorist group has some 150,000 rockets and missiles today — a 12-fold increase over the 13,000 they held before the 2006 war. Both Israel and Hezbollah have tended to abide by a set of rules. In a recent conversation with Tony Badran, Levant specialist and research fellow at the Foundation for the Defense of Democracies, he described those rules as an algorithm that governs their actions, where each side makes tactical calculations regarding what and where they can target without triggering a full-blown war. What is happening now is likely another recalibration of those rules. The limits have been tested several times before. Take, for instance, the events in January 2015. 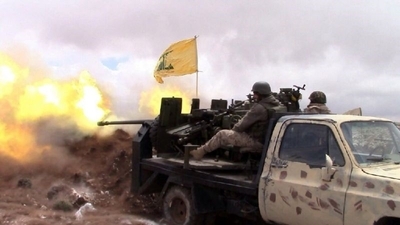 Hezbollah Secretary-General Hassan Nasrallah bragged of the organization's newly acquired Iranian-made missiles and threatened to overrun northern Israel, which responded by striking a convoy in Quneitra, a border town between the Israeli and Syrian side of the Golan. The attack killed 12 Iranian and Hezbollah senior officials and bodyguards who were dispatched to set up staging areas for launching attacks, creating a new front against Israel in Syria. Several days later, Hezbollah responded with an attack that killed a Spanish United Nations peacekeeper, two Israeli soldiers, and injured seven others. Despite fears the situation would descend into war, the two sides de-escalated after Israel enforced an adjustment to the algorithm, namely that it would not allow Iran or affiliated forces to gain another toehold along Israel's border with Syria. Hezbollah also managed to impose changes to Israel's rules of engagement. For example, Israel has been able to attack Hezbollah and its assets in Syria and along the Syrian-Lebanese border but not within Lebanon itself. The main complication to the largely static algorithm is the result of Russia's entry into the Syrian cauldron in September 2015. It constrained both the location of acceptable targets and the area of operations from which Israel could strike. "In practice," Badran explained, "it has so far meant Israeli attacks north of Homs have been off-limits." He points to two examples from 2013 involving strikes near a base in the Mediterranean port city of Latakia, Syria. Since Russia's entry, Israel has refrained from attacking north of the Russian port and base in Tartus, which is no doubt a reason Iran hopes to set up its own coastal military base nearby. As Badran indicated, "the Iranians would like to find a location that falls under the Russian air umbrella that would deter Israel." The Russian X-factor points to the glaring lack of leverage the U.S. currently has in Syria. By design, all roads to an understanding over Syria currently lead to Moscow. Vladimir Putin stands at the top of the Syrian power pyramid with Iran and its proxies underneath. Assad, who is currently conscripting old men and underage women to serve in his military, depends on the whims of his patrons and Washington's acquiescence to define his relevance. That leaves Iran and Israel scrambling to Russia to press their case and find out what room to maneuver Putin will allow. Iran's Supreme Leader Ayatollah Ali Khamenei is ultimately responsible for the strategic decision to send Hezbollah to war with Israel and he is unlikely to do so now. It makes little sense to weaken an important asset today when he understands his military, economic and political position will be greatly enhanced by waiting a few years for the provisions of the nuclear deal to expire. Moreover, by choosing the interests of the Islamic Republic over the Islamic State, the U.S. helps guarantee Russia and its Iranian axis will emerge as the real winners in Syria. In that sense, everything about the current conflict is coming up roses for Tehran. The better question, then, is what level of frustration will Putin tolerate as Iran and Israel pursue agendas in Syria that are contrary to his own? And what appetite do the Trump administration and Congress have in Syria to change any of their calculations? This article originally appeared under the title, "Prepare For Battle: Israel, Hezbollah on the Path to War." It is changed here to more accurately reflect the point of the article.